New Delhi, October 04, 2011 – Saga Music, a rapidly-growing music distribution company expanding its footprint in Bollywood, today announced acquisition of physical and digital distribution rights for the music of director Praveen Kumar’s upcoming Hindi movie Jo Dooba So Paar: Its Love in Bihar. 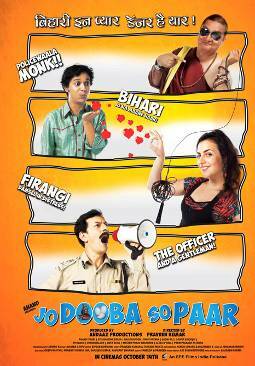 The offbeat romantic comedy features Vinay Pathak, Rajat Kapoor and Anand Tiwari in lead roles. The cast also includes Sadiya Siddique, Pitobash Tripathy, Dadhi Raj, Uttam Haldar, Purav Bhandare, Sita Ragione Spada, Vivek Setia, Prem Prakash Asthana and Alexx O’Neil. The movie is slated to release on Friday, October 14. The story revolves around a failed but determined Bihari youth, Kishu, falling in love with an American girl, Sapna, who visits Bihar to research on Madhubani Paintings but gets kidnapped in the middle of rampant corruption and pandemonium. The music and the background score of the movie is composed by Manish J. Tipu and the lyrics are by Shailender Singh Sodhi, aka Shellee, Sibtain Shahidi and Gopal Tiwari. The album comprises of tracks of nearly every variety – from romantic to comedy to dance numbers. The lead songs include Shiv ka bajey damroo and Andey garam garam, sung by Tochi Raina & Pia Sukanya and Raghuvir Yadav respectively. The other songs of the movie are Chala Hoo, Saaley and Pehli Baar Dekha, rendered by singers Kirti Sagathia, Aditi Singh Sharma and Manish J. Tipu. Saga Music also owns music rights of a number of other Hindi movies including Allah Ke Banday, Tera Kya Hoga Johny, Bhindi Bazaar, West is West, Khap, Chala Mussadi Office Office and Stand By amongst others. In addition to Bollywood, the company has released the music of over 15 Tamil movies including the mega blockbuster Poonar Shankar and of almost 100 Punjabi singers including Harbhajan Maan, Hans Raj Hans, Salim, and Gurdaas Maan. Commenting on the announcement, Mr. Alipt Bhatia, Business Head of Saga Music said, “We are proud to have been awarded the music rights of Jo Dooba So Paar. Saga Music, in the past too, has been associated with a number of prestigious movie banners and this project is yet another milestone in continuing our journey as one of the most preeminent emerging music companies in Bollywood”. An Anand Entertainment presentation, the movie has been produced by Andaaz Productions. Sony Pictures is the distributor of the movie, while Unisys Infosolutions holds the digital distribution rights for making the audio and video content available on popular entertainment portals and mobile devices. 17 queries in 0.785 seconds.